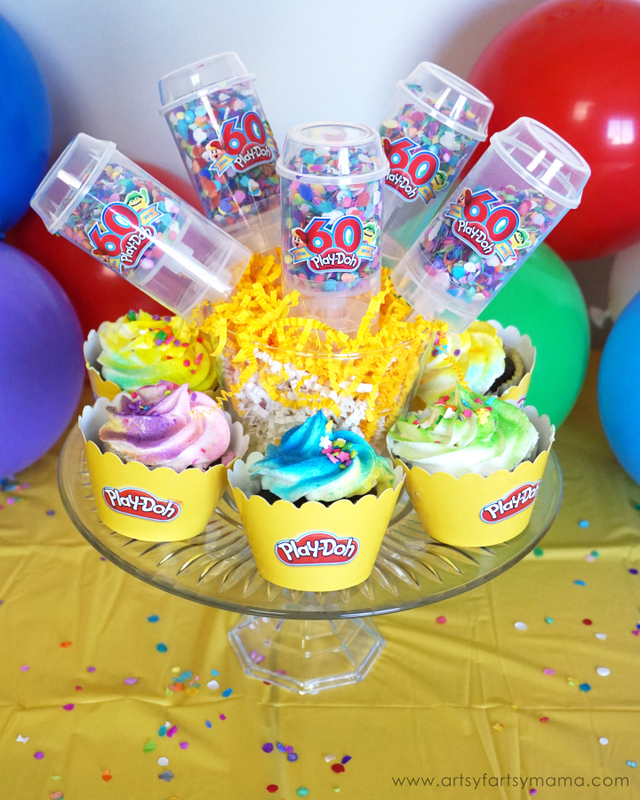 Did you know that Play-Doh is celebrating its 60th Anniversary this year? My daughter and I had a Play-Doh birthday party with some friends to celebrate the big day. 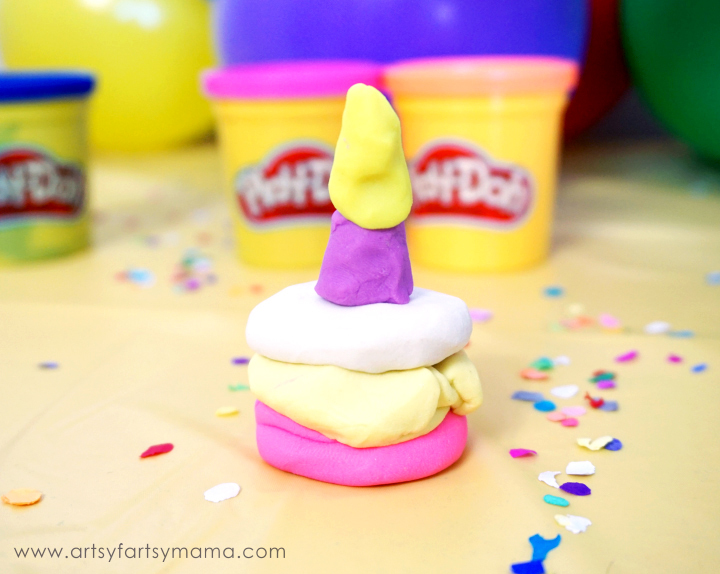 We're excited to share some of our party ideas to inspire your future Play-Doh-themed birthday parties of your own, and to encourage you to play with Play-Doh and share your creations on September 16th for #WorldPlayDohDay! Our centerpiece for the party table was some Play-Doh 60th anniversary confetti poppers surrounded by colorful shredded paper and wrapped Play-Doh cupcake wrappers around colorful, sprinkled cupcakes for each guest. I arranged them all on my $2 cake plate so they would be up and out of the way while we created. I opened up the 20-piece Play-Doh Super Color Pack and built a tower so guests could see at a glance all the different colors we'd get to create with! Every party needs some kind of refreshments! So to go with our cupcakes, I whipped up some punch and poured in into some super fun Play-Doh water bottles that guests could drink out of while we created, and could also take them home as a party favor! Even though Play-Doh has been around for 60 years, it's just as much fun for my daughter to play with now as it was for me when I was her age. 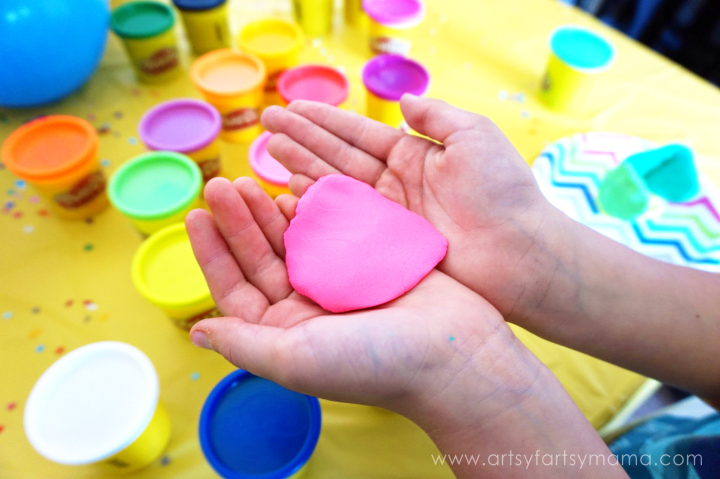 Just the smell of Play-Doh fresh from the can brings back memories! The kids loved choosing colors, squishing the dough and thinking of creations to build. 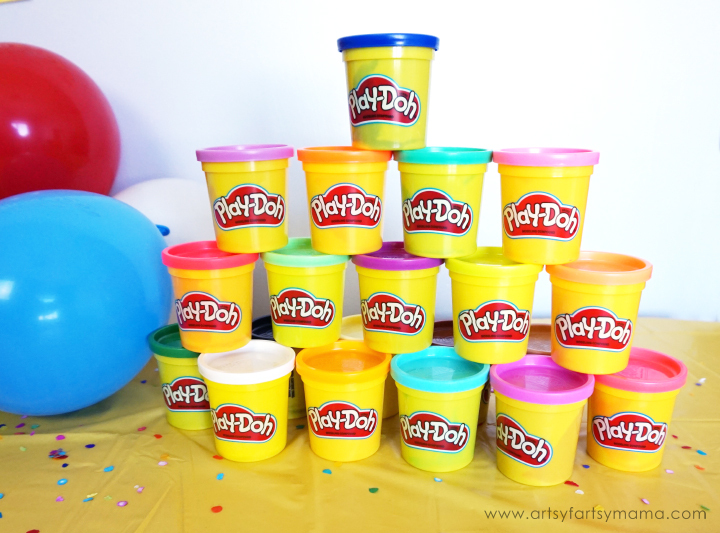 For a little building inspiration to get started, I suggested that everyone should build something birthday-themed to celebrate Play-Doh's big day. This slice of birthday cake with a burning candle was too cute! My daughter is a blooming "foodie" and decided to build this "three layer sponge cake with vanilla, lemon, and strawberry flavors topped with a birthday candle". 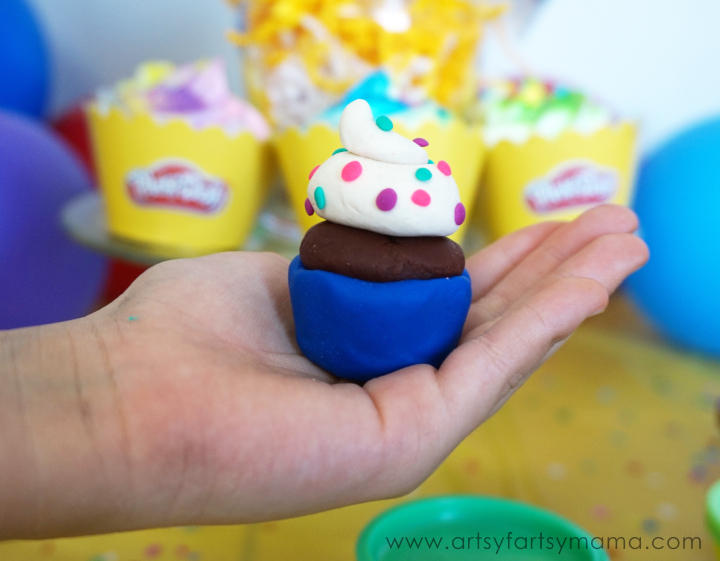 This sprinkled cupcake was made to match our cupcake treats! There were also some birthday presents, balloons, and more made. I just love seeing all the creativity that comes from kids when they're surrounded with Play-Doh!! 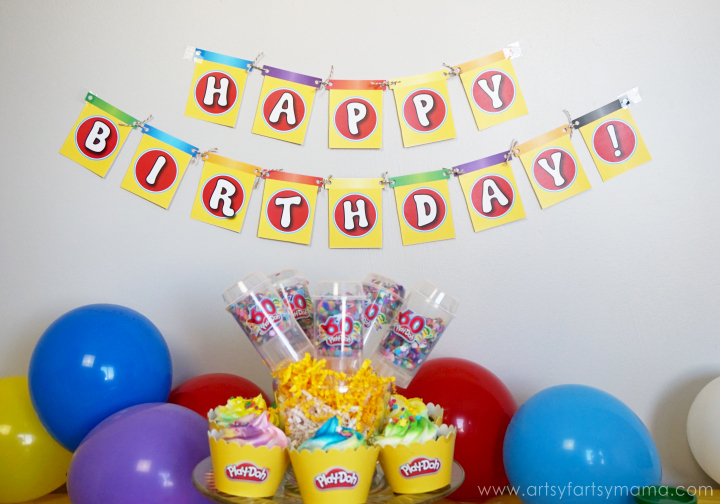 I have also designed a free printable "Happy Birthday" banner that you are welcome to print for your own parties. Download the design and print it out. Then cut out each letter. 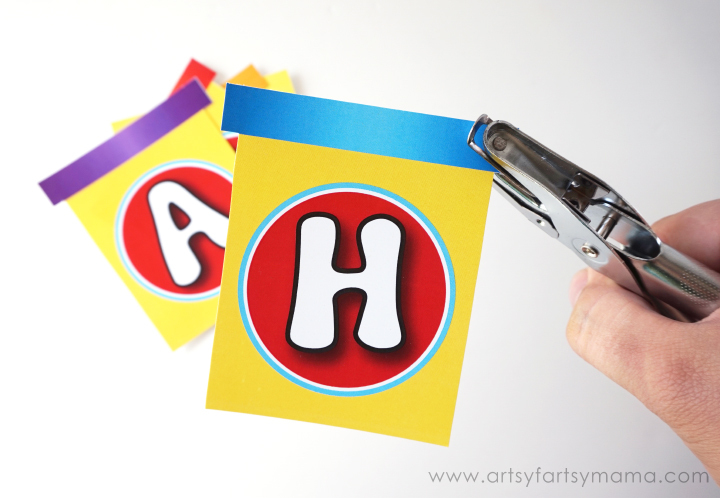 You can tape the letters up on their own, or turn them into a banner by first using a hole punch to make a hole on each side. 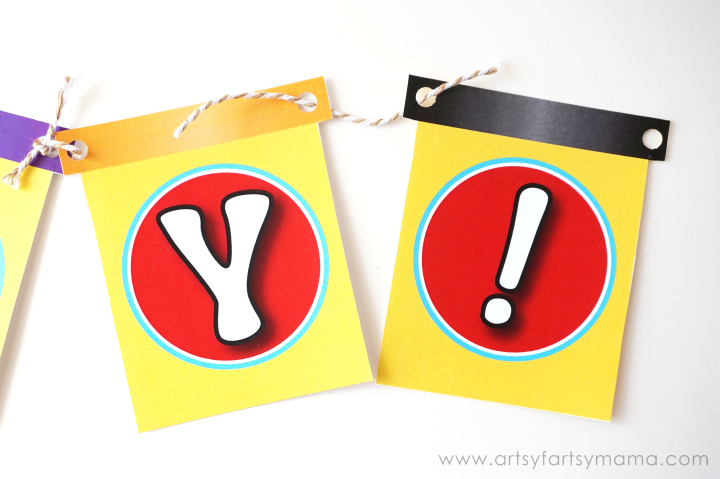 Once you've punched all the holes, grab some string, twine, or gift ribbon and tie each letter together. Hang the banners up on the wall above your decorated table and you are ready to party! *If you share this on the internet, credit must be given and linked back to this post. I also blew up some colorful balloons and added them to my tablescape for a little more birthday fun. 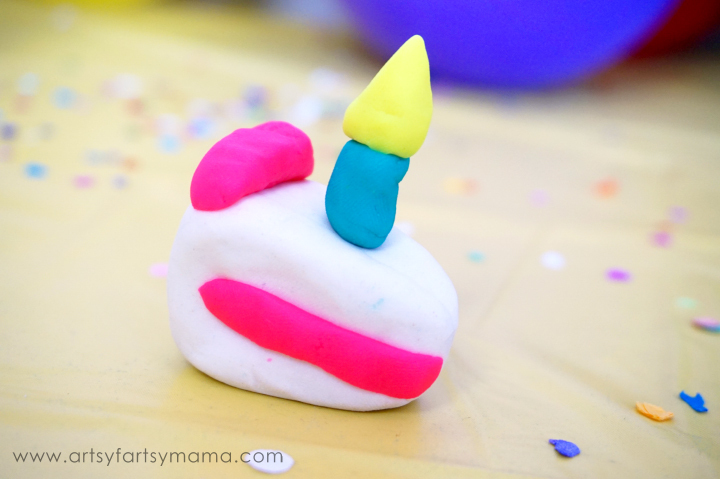 I hope you enjoyed this post and have been inspired to have your own Play-Doh Birthday Party! I'm excited to see everyone's Play-Doh posts on social media this Friday, September 16th for #WorldPlayDohDay! What a cute party idea! I know they had fun. I love play-doh!! This is absolutely adorable! LOVE it so much! 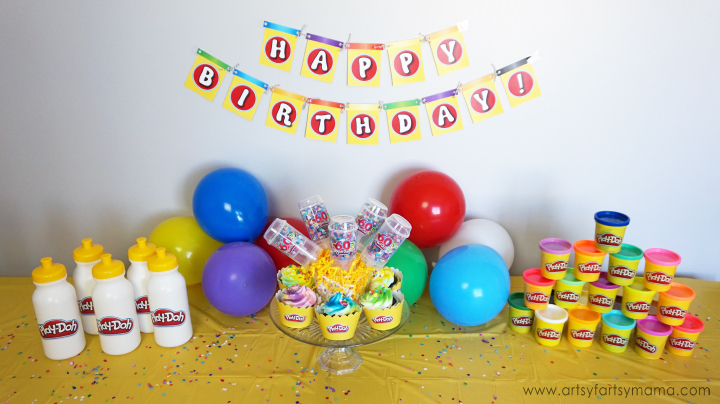 We adore Play Doh in our household and would definitely consider this for a birthday party! So cute! My kiddos would have love this when they were younger! 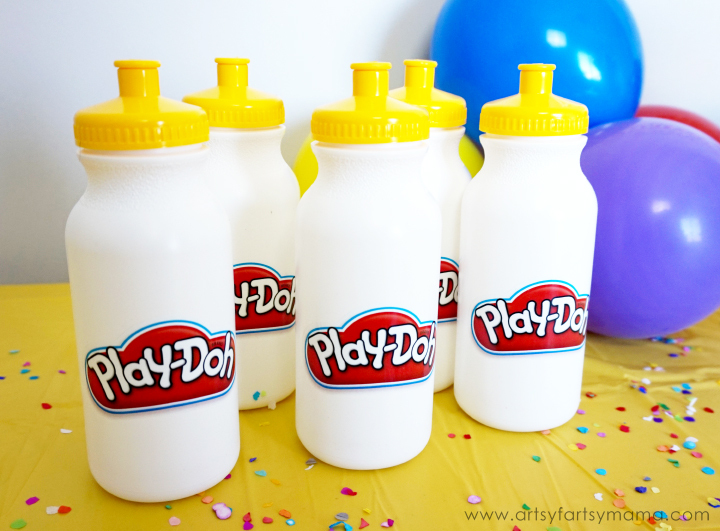 LOVE your ideas , I'm having a playdoh party in About a month and a half and I absolutely adore those water bottles , where did u purchase them from ?